It is looking increasingly likely that the bull market is OVER. The Russell 2000 (IWM) has lead the S&P 500 throughout the bull market begun January 2016. Over that time period, the Russell 2000 rose 54% compared to the S&P 500’s performance of 42%. 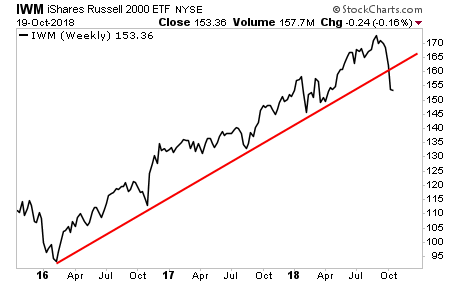 This is of major importance because the Russell 2000 actually peaked back in July and has since broken its bull market trendline. You can add this to the string of MAJOR warnings we're getting about stocks. 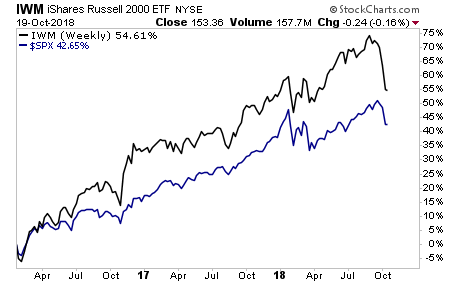 If you think the market is healthy, take a look at the homebuilder ETF (XHB) relative to the S&P 500. 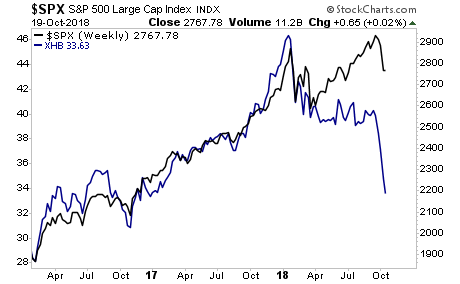 So you've got the "growth index" (the Russell 2000) ending its bull market... while economically-sensitive sectors like homebuilders are in full-scale Meltdown Mode. The message here is clear: BUCKLE UP. On that note, we offer a FREE investment report outlining when the bubble will burst as well as what investments will pay out massive returns to investors when this happens. It’s called The Biggest Bubble of All Time (and three investment strategies to profit from it). We made 100 copies to the general public. As I write this there are only a handful left.